I don't know about you, but I will consuming my fair share of ham this weekend. I will not be hosting Easter in my home, but I most certainly will have a ham ready for leftover sandwiches and other yummy eats. This is hands down the easiest, juiciest, and tastiest (in my opinion) ham recipe I have. I simply must share it with you before this weekend when many of you will be hosting Easter gatherings and Spring celebrations. When cooking a ham, the most important thing to remember is that most of them are fully cooked (I'll save the fresh and partially cooked recipes for another time). This means that the ham only needs to be warmed through-- think of it as reheating at a low temperature. Like other large roasts, I let the ham come to room temperature before baking. This ensures even cooking. I approach the preparation of the ham in two steps--- baking and glazing. Before baking, I cook the glaze and allow it to cool. It becomes thick and spreadable, allowing it to adhere to the ham better. When ready to bake, I wrap the ham in foil. This prevents the ham from drying out (remember, we are just warming it through). Once the internal temperature of the ham reaches 125° F, I remove it from the oven and increase the oven temperature to prepare for the glazing of the ham. The higher temperature caramelizes the sugars in the glaze making for a sweet and sticky crust. 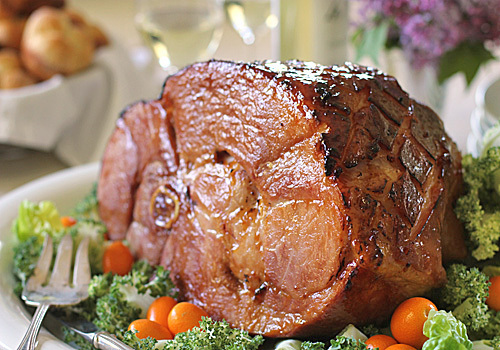 Served warm or at room temperature, this process makes a juicy, delicious ham. Let the ham sit out for 1 1/2 to 2 hours to reach room temperature. This will ensure even warming of the ham. Meanwhile, in a medium saucepan bring the jam, brown sugar, mustard and bourbon to a boil then reduce the heat and simmer, stirring frequently to keep the sugars from scorching, until slightly reduced to about 2 cups, about 15-20 minutes. Transfer the glaze to a bowl and allow to cool slightly. Glaze will thicken to a spreadable consistency; set aside. Position a rack in the lower third of the oven and preheat the oven to 325° F.
Line several large heavy duty sheets of aluminum foil perpendicular to one another with overhang across a heavy duty, rimmed baking sheet. Place the ham in the middle of the foil and spread half of the glaze over the surface of the ham. Bring the sides of the aluminum foil over the ham and wrap loosely. Bake until an instant-read thermometer reaches 125° F ( about 17-19 minutes per pound) for a total of 2 1/4 to 2 3/4 hours. The temperature of the ham will continue to rise during the glazing and resting. Remove the ham from the oven and raise the oven temperature to 425° F. Peel back the foil and turn the sides of the foil in towards the ham. This prevents any sugars on the inside of the foil from scorching and burning which causes unpleasant smell and smoke. Using a sharp knife, score the top of the ham by making a diamond shaped grid pattern, cutting through the skin and the fat (about 1/16-inch), then spread 1/3 of the remaining glaze over the surface. Return the ham to the oven. After 5 minutes and then again at 10 minutes, repeat the glaze using 1/3 each time until the glaze is shiny and golden, about 20 minutes total. Keep a close eye on the ham so the glaze doesn't burn. Remove the ham from the oven and transfer to a cutting board or serving platter and tent loosely with foil for at least 20 minutes and up to 2 hours before slicing. Reserve any accumulated juices for serving if desired. Enjoy! Oh my this ham does look super juicy and delicious! What is lining a baking sheet with foil perpendicular to one another? Line the sheet with one length of the aluminum foil and place another sheet of aluminum foil in the opposite direction. This ensures that the ham is properly wrapped. I made this for Easter last year. It was my first time to make a ham, and oh my goodness it was perfect! I also made your roasted asparagus and it was a HUGE hit (the peeling trick was greatly appreciated). I am so pleased that you enjoyed the recipes. Thank you for letting me know☺.